these are the only photos of the Endymion that I know to exist. The following notes are written on the reverse of this photo of the Endymion. The Endyimon a steam trawler was lost on the horsebank on July 31st 1933, this photo was taken by Mr Charles Hatch of Bibby Road in 1935. In an attempt to refloat her two dredgers came down from Preston but the trawler was deeper drafted and the dredgers had to leave her where she lay as they were unable to get close to her. During the Second World War she was used as target practice, and a number of locals tried to get her bronze propeller off her but none were successful. She still lies on the back end of the Horsebank but there is very little left of her now. 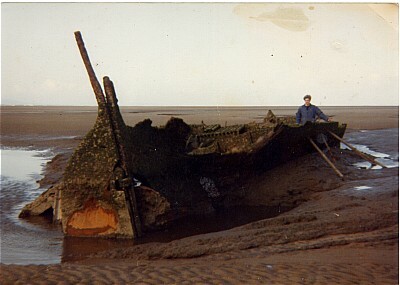 The Southport Visiter reported that the Endymion was a Steam trawler that was being towed from Fleetwood to Preston when it broke adrift in rough weather and was abandoned, they stated that it came aground on a sandbank South of the Pier on Friday last. It appears to have drifted about for several tides and then settled on the Horsebank. A second steamer appeared in the Channel about two miles from the end of the pier and one mile from the Trawler, and it became clear that this vessel intended to attempt to tow the trawler off the horsebank. The vessel managed to get within 300 yrds of the trawler and put a hauser aboard with the intention of attempting the pull at high water. Unfortunatly this was not successfull and the second vessel had to leave the trawler where it lay. 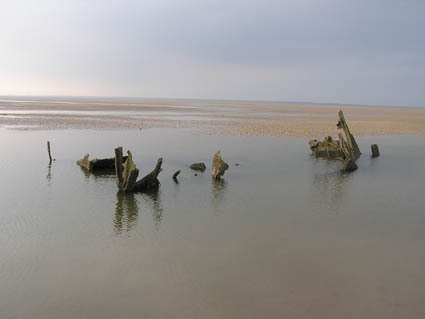 After several large tides the trawler was carried further up the horsebank where it became impossible to recover her. During the war the Trawler was used for target pratice which must have accounted for it breaking up rather quicker that would normally be. 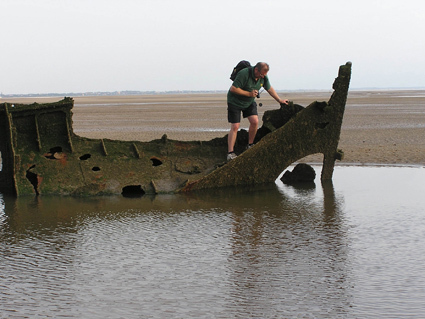 In June 2006 after establishing the wrecks location and the tide times, a small group of intreped explorers decided to visit the Endyimion wreck to see what was left of her. 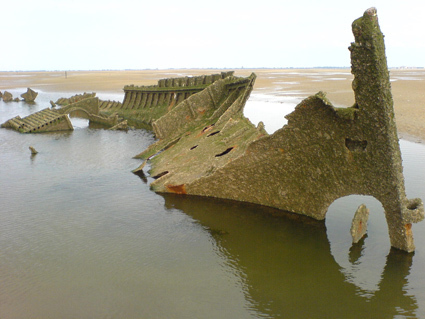 It is a difficult wreck to visit as it is a number of miles from the shore in a remote location. I would NEVER advocate anyone visiting her without taking a guide familiar with the tides and sandbanks, this especially because of the wrecks remote location. in the boiler and the engine room plates. This view is looking towards the bow. Photo from the Peter Kenrick collection. 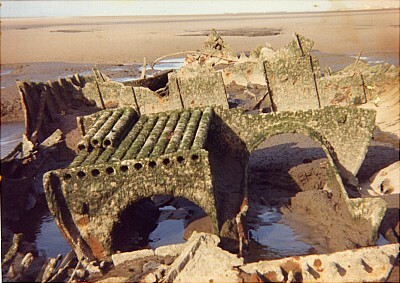 Photo taken in 1983 showing the stern post and rudder. and how these had rusted away in 23 years. 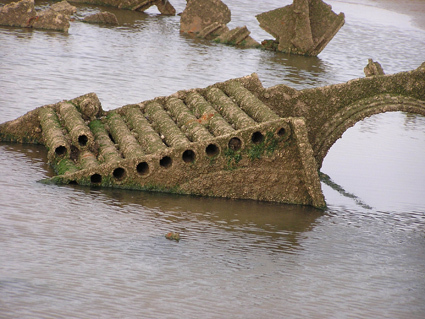 The wreck is still quite substantial and it is possible to actually crawl aboard ! 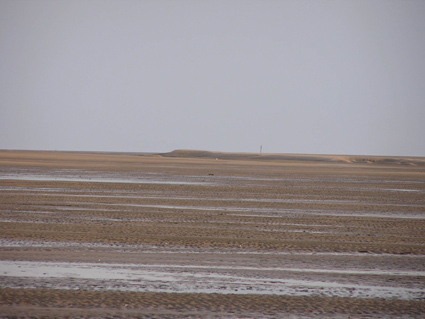 This is the view Seaward from the Endymion showing the build up of sand thought to be caused by the force of the tidal flow coming down the Pinfold Channel dumping the sand in this area. Quite an amazing sight the sand must be over 15 feet tall ! A view from the starboard side showing the boilers. 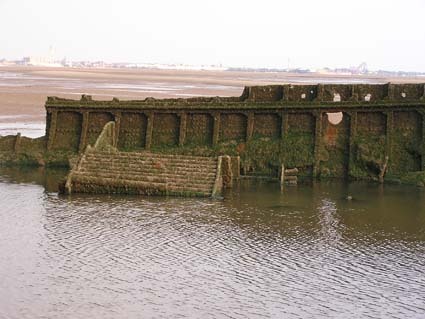 View of what is left of the bow from the port side.